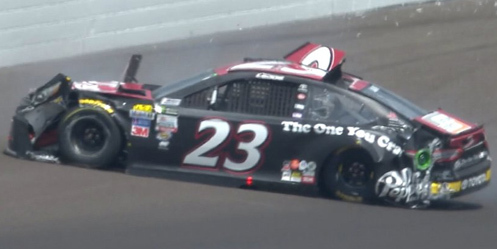 Corey LaJoie picked up the 2nd last-place finish of his Monster Energy NASCAR Cup Series career in Sunday’s Brantley Gilbert Big Machine Brickyard 400 at the Indianapolis Motor Speedway when his #23 Dr. Pepper Toyota was involved in a single-car accident after 9 of 167 laps. 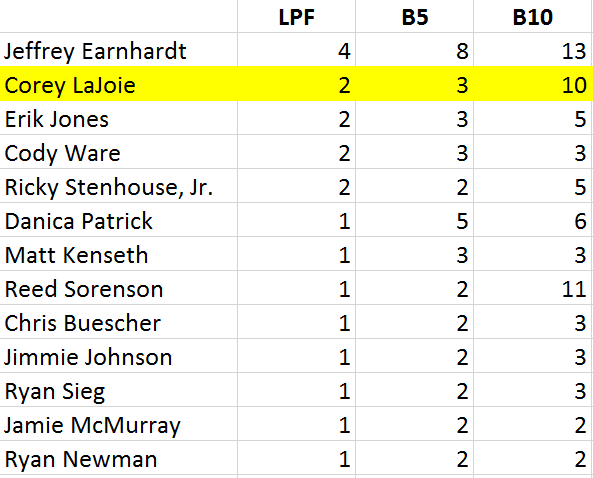 The finish, which came in LaJoie’s 19th series start, was his second of the season and his first since Las Vegas, 17 races ago. 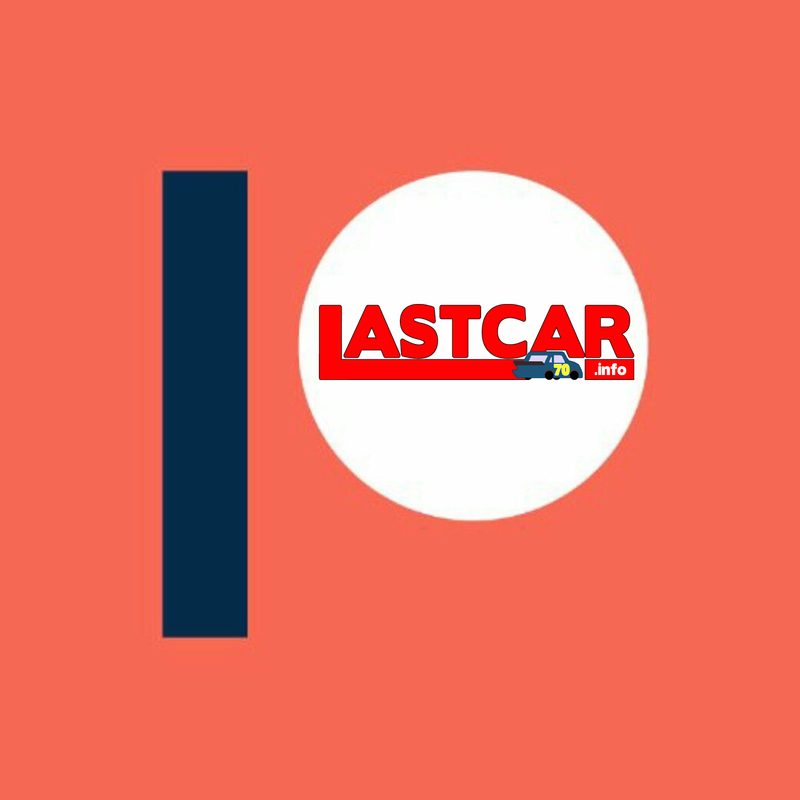 With 16 races to go, LaJoie takes second in the 2017 LASTCAR Cup Series rankings on a Bottom Ten tiebreaker with Erik Jones, 10-5. He trails current leader Jeffrey Earnhardt by two finishes. 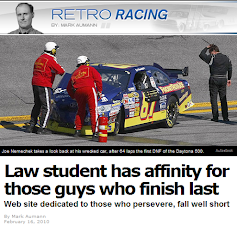 Without doubt, the highlight of LaJoie’s rookie season came earlier this month at Daytona. 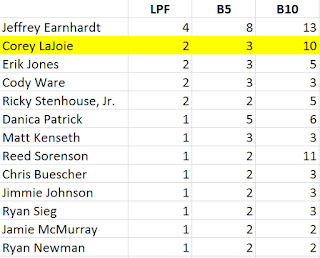 After a disastrous SpeedWeeks where he was involved in a controversial wreck with Reed Sorenson during his qualifying race, then crashed during a green-flag pit stop in the 500, LaJoie finished a strong 11th, besting Jimmie Johnson and all three Joe Gibbs Racing teammates. Prior to that night, the second-generation racer hadn’t finished better than 24th. It’s been a difficult year for BK Racing. The team’s 2016 drivers David Ragan and Matt DiBenedetto left at season’s end, as did Ryan Ellis, whose #93 team was closed. Their shop was briefly padlocked in December, and a $1.46 million judgment was levied against team owner Ron Devine. BK then scaled back from two Charters to just one, the #83’s guaranteed spot sold to Front Row Motorsports, who leased it to TriStar Motorsports’ #72. Both BK cars parked during the Monster Energy Open, and LaJoie’s teammate Gray Gaulding was released in June. While BK has courted new talent, bringing in NASCAR Euro Series race winner Alon Day at Sonoma and perennial XFINITY Series underdog Ryan Sieg for multiple races, the team has begun to scale back its current two-car operation. While the #83 was originally slated to run part-time, BK Racing had managed to run a full-season effort alongside the #23 through 15 races. But Day’s debut at Sonoma saw BK not enter the #83 for the first time since the team’s 2012 reorganization from Team Red Bull. Ryan Sieg was slated to run the car in Sunday’s race, but the entry was withdrawn on Wednesday, leaving 40 cars for 40 spots. Starting 40th on Sunday morning was B.J. McLeod in a black #51 for Rick Ware Racing. 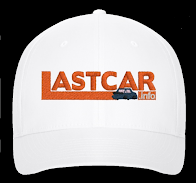 On Thursday, it was announced that the team had severed ties with East Carolina University, whose logos were on the team’s car at Dover and were scheduled to once more at Indianapolis. Reports indicated that a deal to acquire other sponsors to cover the cost didn’t materialize, forcing Ware to run the sponsors out-of-pocket. Clemson University, which ran on the car at Pocono, is expected to back the #51 at Darlington in September. While last-minute sponsorship for the #51 did arrive from American Campus Communities, and while McLeod put up the 35th-fastest lap, the official starting lineup placed him behind A.J. Allmendinger, who did not take time due to handling issues on his #47 Kroger ClickList Chevrolet, and did not record McLeod’s time. As of this writing, I have not obtained information explaining the reason for this, though it seems to indicate McLeod’s time was disallowed. Joining McLeod at the tail end of the field were Joey Gase, whose #15 The Lisa Colagrossi Foundation Chevrolet required an engine change, and both Jimmie Johnson’s #48 Lowe’s Chevrolet and Cole Whitt’s #72 Moen Chevrolet, both sent to the back for rear gear changes. Johnson’s penalty was particularly damaging, as he had put up the 4th-fastest lap in qualifying. By Lap 3, McLeod had fallen to the back of the pack, and on Lap 6 he was drafting Gase’s #15, the two of them 29 seconds behind the pack. By all accounts, they were still running in the back when the first caution fell on Lap 10. Heading through Turn 3, LaJoie cut down what was either a left-rear or right-rear tire, sending his Toyota hard into the outside wall. While the rookie managed to drive his car back to the pits, the damage to the rear and left-front of the machine was too much to clear the “Crash Clock,” and he pulled into the garage, done for the afternoon. During the same yellow, first a lightning warning, then a large rainstorm stopped the action, forcing a delay of 1 hour and 47 minutes. The rest of the Bottom Five was filled by mid-race. Next to retire was Chase Elliott, whose #24 NAPA Auto Parts Chevrolet sputtered after the delay, filled the cockpit with smoke, then finally lost the engine on Lap 43. 38th-place David Ragan was eliminated in a multi-car wreck on Lap 58 that crunched the nose of his #38 Dockside Logistics Ford. 37th went to J.J. Yeley, who after recovering from the Ragan wreck lost a right-front tire on Lap 72, finishing off Tommy Baldwin’s #7 Accell Construction Chevrolet. Rounding out the Bottom Five was a dejected Dale Earnhardt, Jr., who rear-ended Trevor Bayne on the restart following Yeley’s crash, destroying the front valence and radiator on his #88 Nationwide Insurance Chevrolet. 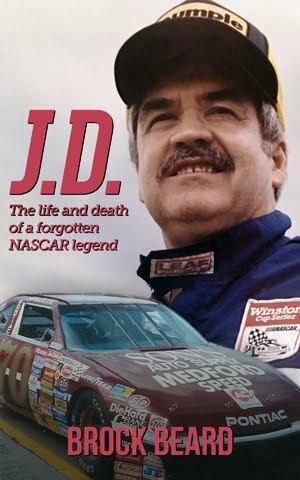 Seven more accidents followed Earnhardt, Jr.’s, resulting in the longest and craziest Brickyard 400 in the event’s brief history. When the stay-dri settled, the finishing order saw several strong runs by different drivers. On top of Kasey Kahne, who ended a nearly three-year winless streak, Matt DiBenedetto improved on his season-best 9th in the Daytona 500 by bringing the #32 Corvetteparts.net / Anest Iwata Ford home 8th, the second-best finish of his career. A.J. Allmendinger rebounded from his qualifying struggles to following his JTG-Daugherty Racing teammate Chris Buescher home, putting them 9th and 10th. Danica Patrick ran 11th, her second-best finish of the year and first run better than 22nd in the event. TriStar Motorsports had just one start in the Brickyard 400, a last-place run in 2012, until Cole Whitt came back from his rear gear penalty to earn a season-best 12th. And, at the top of the list, Timmy Hill finished 14th in his 200th NASCAR start, marking not only the best finish for Carl Long’s MBM Motorsports (which was making just its fourth Cup start), but Hill’s own best Cup finish since he ran 22nd at Kansas back in 2012. Further back in the pack, last-place starter B.J. McLeod would lose multiple laps with an electrical issue around Lap 60 which caused his digital dashboard to short out. The team managed to fix the problem in the garage and get him back on track to finish the race. McLeod secured a 32nd-place finish, beating both dominant cars of Kyle Busch and Martin Truex, Jr. Jeffrey Earnhardt, whose #33 Hulu Chevrolet suffered cosmetic damage in David Ragan’s accident, managed to finish under power in 26th, beating both Jimmie Johnson and Kyle Larson. Earnhardt’s finish equaled his own season-best in this year’s Daytona 500. *This marked the second-consecutive last-place finish for BK Racing in the Brickyard 400, following Matt DiBenedetto’s engine failure last year, but is the first in the event for car #23. Great analysis!!! Can't believe MBM got such a great finish especially when they are fairly know.